The American Diabetes Association is leading the fight against the deadly consequences of diabetes and fighting for those affected by the disease. The American Diabetes Association (ADA) sought a consumer friendly, diabetes-centric personal health record that would allow patients and consumers to track their health information and share it with family members. Additionally, ADA wanted to make this personal health record relevant to multiple stakeholders of their association, from those consumers who were healthy but seeking health information to those patients managing the complex condition of diabetes. Get Real Health used the InstantPHR® toolset of widgets to tailor a custom solution, then skinned and branded it to the ADA’s look and feel. The resulting application stored patient data directly into Microsoft HealthVault with InstantPHR® as the data visualization layer for ADA. Get Real Health hosted the application and made it available through the ADA’s website for the millions of consumers who visit the ADA website each week. 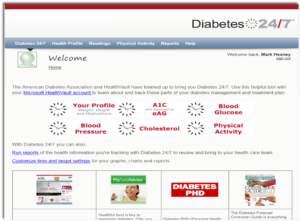 The application, called Diabetes 24/7, collected many information sets. Additionally, the system integrated with more than 75 home healthcare devices and enabled the values from those devices to be visualized in graphical and tabular formats within the site. Home devices most widely used include blood glucose meters, blood pressure monitors, weight scales and pedometers. This solution provided people with diabetes and their family members one central resource for managing their personal health data, as well as reference information to assist them in coping with this chronic disease. Because it was skinned to ADA guidelines and specifications, the interface ensured branding continuity that users would recognize and trust.